(CN) – Billions of pounds of plastic waste enter the ocean every year, and new evidence shows that runoff from just 10 rivers are responsible for a large amount of the waste. The waste is often consumed by fish, damaging their health and sometimes finding its way to the dinner table. In a study published Wednesday in Environmental Science and Technology, German scientists found that up to 4.4 million tons of plastic waste can be traced to the rivers, eight of which are located in Asia. Scientists from the Helmholtz Centre for Environmental Research and the Weihenstephan-Triesdorf University of Applied Science identified the Amazon in Brazil; Huanpu, Xi and Yangtze in China; the Brantas and Solo in Indonesia; the Irrawaddy in Myanmar; the Pasig in the Philippines; the Ganges in India; and the Cross in both Nigeria and Cameroon. Researchers have known that rivers are responsible for introducing a lot of plastic waste into the oceans, but could not precisely pin down the amount and exactly where it originates from. Scientists in the study examined 240 samples from 57 rivers and determined that mismanagement of the 10 rivers accounts for 88 to 95 percent of the total load of plastics in the oceans. The increase of plastic fragments, called microplastics, in the oceans has concerned scientists for years. In 2016, Belgian researchers discovered that microplastics showed up in about a third of all fish caught in the United Kingdom, including shellfish. 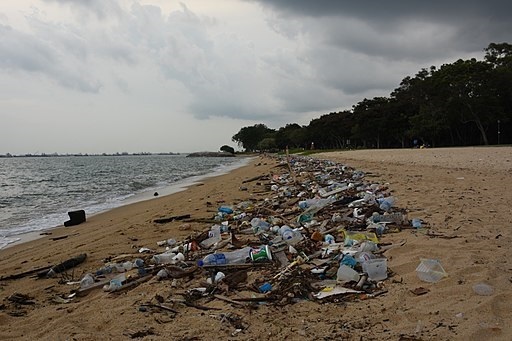 A report from the Ellen MacArthur Foundation and World Economic Forum predicts that plastics will outweigh fish by 2050. Most plastic products find their way into landfills and the ocean rather than the recycler. It’s estimated that only 14 percent of all plastic packaging is recycled, making products like bottled water the largest source of plastic pollution.